Crown raising is a type of tree trimming where the goal is to remove low hanging growth to provide clearance for buildings, signs, vehicles, pedestrians, and lines of sight. Many trees are over pruned when the crown is raised. Removing too many lower limbs can interfere with trunk taper and compromise the trees structural stability. Live branches should be left along the upper 60% of the trunk. Typically when preforming crown raising, a set height is mandated for clearance over the street or yard, and another is set for clearance away from structures. The drip line is then balanced to maintain a symmetrical shape while still meeting clearance requirements. 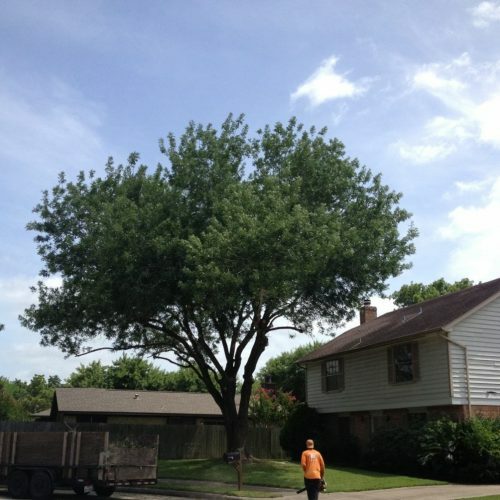 Pictured above is before and after crown raising on a tree species that is too large for the space, and was planted too close to the two story house. 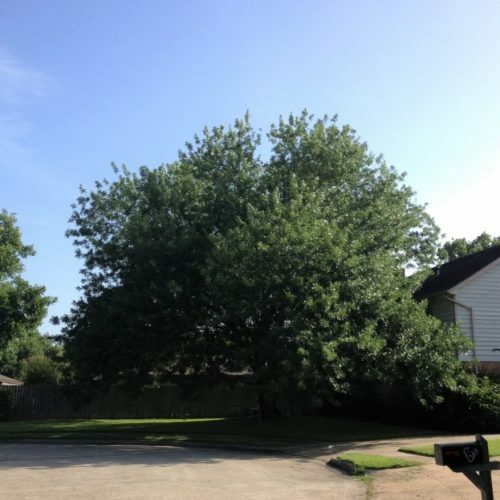 Due to the tree type and location, the pruning height is a little more than desirable. However, proper cuts were made in order to achieve the recommend clearance from house, yard, street, and driveway.